... the passion, energy and sheer joy of the band and its audience at their very best. 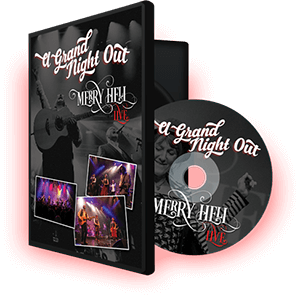 This DVD contains Merry Hell's sell-out performance at The Grand, Clitheroe (28th February, 2015). It shows the passion, energy and sheer joy of the band and its audience at their very best. Here's the Merry Hell track 'Summer Is A-Comin' recorded live at The Grand, and part of the live DVD. The track is also available on Merry Hells latest album 'The Ghost in Our House and Other Stories'. So why a live DVD? “Since the start of the Merry Hell adventure we’ve never failed to be delighted by the positive responses we’ve had to pretty much everything we have done. All the three albums we’ve released to date have received excellent reviews, for which we’ve been immensely grateful – not least because they contain our own songs played and sung in our own way. You can pre-order yourself a copy of the DVD HERE.